The guys at Trail Designs have built a great reputation for themselves by providing innovative products and excellent customer service. 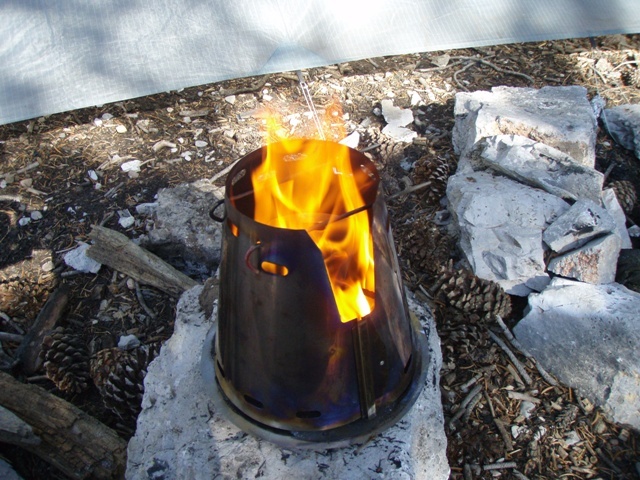 Their Caldera Cone system was a revolution in UL wind screen/pot holder design, and since my first purchase (for my MSR Titan kettle), I've been a fan. 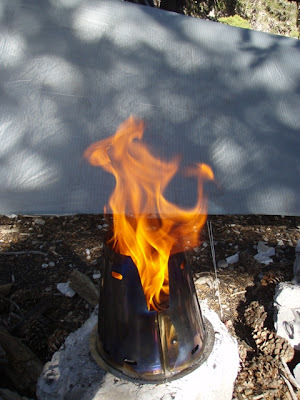 Building on a great idea, they created the Ti-Tri, a titanium version of the Caldera Cone which is capable of using three types of fuel (alcohol, esbit, or wood). A while back I purchased one of these Ti-Tri systems from their partners at Titanium Goat, along with an 1100ml pot and lid combo. 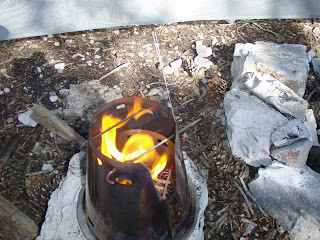 With a total weight of 7.55oz for the cone/floor/pot/lid combo, this quickly became my favorite stove system. Not only was it light and large enough for two people, in wood burning mode it boiled 2 cups of water in an incredible 5 min 15 sec...and I no longer had to carry fuel! 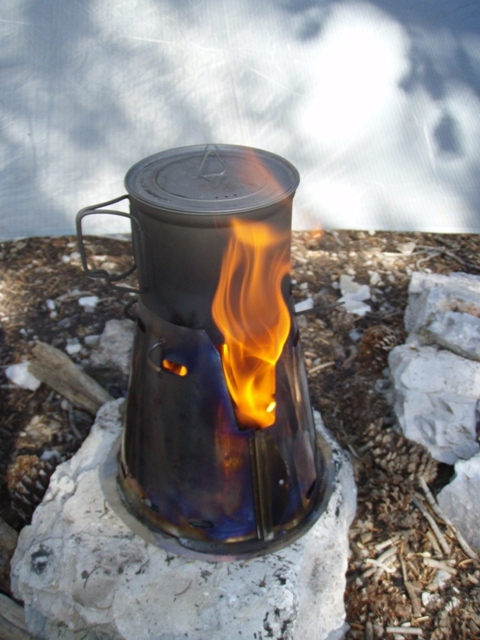 I recently learned that they have been working with a prototype of an inverted downdraft gasifier version of the Ti-Tri, which is the same double walled technology used in the popular Bush Buddy stove. While I do not own a BB, I have experimented with many different MYOG BB designs, and this TD version peaked my interest. I contacted Rand via email, and within one day he and Russ had made the Inferno insert and had it in the mail to me so I could use/test it on a trip I had planned to Charleston Peak, high above Las Vegas (approx 10,500' where I camped) that weekend. 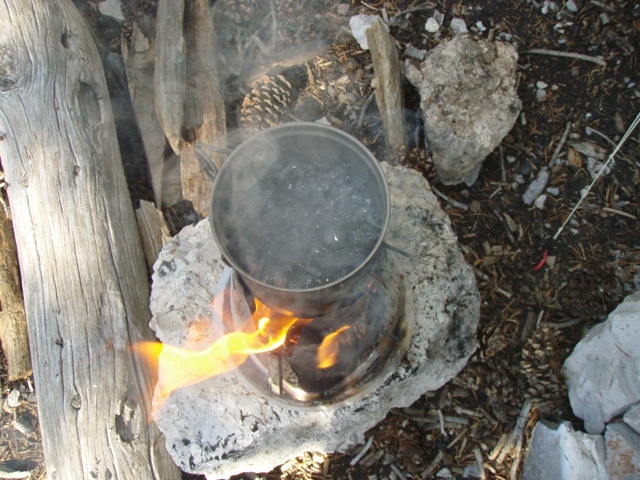 2 cups water boiling in just over 5 min! 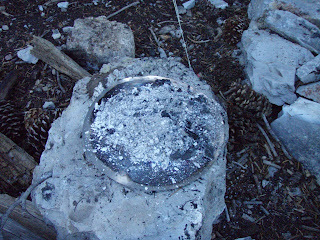 Ti-Tri Inferno in camp fire mode...I loaded this thing up to the top with wood and pine cones, and it never smoked! Note: I didn't count the ti stakes because I use two from my tarp set up. Both systems boiled 2 cups of water in approximately the same time - 5min, 15 sec. Is the additional 1.25oz of the Inferno worth its weight? The bottom line is, both the Ti-Tri and the Ti-Tri Inferno work well, but the Inferno model just works better in wood burning mode. If you want a wood burning stove that's easier to light and requires less tending to, and want a cleaner burn (i.e. 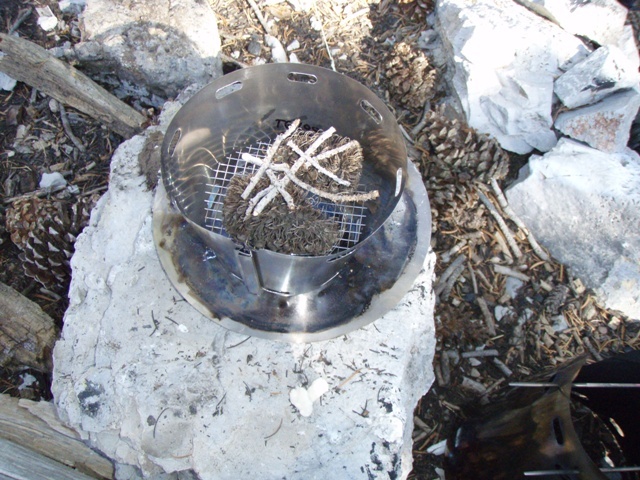 less smoke in your face), then the Ti-Tri Inferno may be the right stove for you. . Trail Designs has made a great system even better. Because the Inferno enhanced my back country experience, to me as least, the additional 1.25oz is worth its weight if I don't plan to carry fuel and am cooking for two people. That's why I gave it a rating of 4.5 our of 5. (Previously published on www.backpackinglight.com 8/2009).